According to the Mennonites and Amish, education can be a useful and helpful experience for young people if it prepares them for success within their respective Mennonite and Amish communities. In other words, the Pennsylvania Mennonites and Amish value education if it teaches them about farming, animal care, carpentry, masonry and other skills conducive to their lifestyle in agricultural Lancaster County. It is generally only the conventional education, found in the average American school system, that the Amish shun. They don't value science, technology and the arts because they don't feel that it is necessary to their lifestyle or compatible with Amish values. To the Amish, an eighth grade education is considered adequate preparation for Amish life. During the 1950's, there was increasing pressure by the federal government to consolidate elementary and public high schools. This was deemed a great threat to the Amish. The Amish wanted their children taught in local schools where they would not be exposed to values such as individualism, competition, evolution, materialism, and secularism which would undermine Amish life. It was thought that if Amish children developed critical thinking they might question Amish traditions and the church. They might want to go to college and enter a professional occupation. The Amish youth might decide to leave the farms and their communities forever. As a result of this conflict between Amish parents and school authorities, dozens of parents were arrested and imprisoned in the early 1950's for refusing to send their children to consolidated elementary and high schools. Eventually, Amish church leaders felt that the best way to stop their children from being forcibly enrolled in consolidated schools was to operate their own Amish schools. 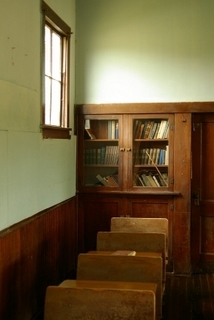 Amish communities began to build one-room schools which students attended to the eighth grade. However, state law dictated compulsory attendance to the age of 15. 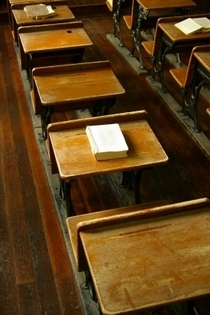 This meant that Amish teenagers were required to spend a ninth grade in a public school. Needless to say, this upset a lot of the parents. After several years of debate, Amish community leaders and public officials worked out a compromise. This compromise known as the Amish Vocational Program allows for Amish youth to attend a weekly vocational school at the age of 14 after completing the eight grade in their parochial school. Held for three hours a week in an Amish home, an Amish teacher instructs the teenagers in practical vocational skills. Students are required to maintain a diary of their work activities throughout the week. The right to maintain a community-based Amish education for their students was given full legal status by a landmark May 15, 1972 decision by the United States Supreme Court. In brief, the decision exempted Amish and related groups from state compulsory attendance laws beyond the eighth grade on the grounds that a conventional formal education provided by a certified high school interferes with the child's adolescent period of religious development. There are over 150 one-room Amish schools in Lancaster County today. Each school has an average of 30 students. There is no " busing" or transportation problems because the schools tend to be within walking distance of the students' homes. 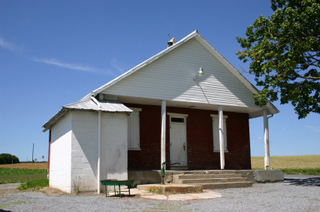 The Amish schools are maintained by a local school board who enforce school policy and hire teachers. The teachers are usually local adults who have graduated from the school themselves and who are committed to Amish values. They are usually always women. The Amish curriculum teaches the basic skills of reading, writing, basic mathematics and geography. Both German and English are taught in the schools. Although the schools provide devotional exercises, religion is considered too sacred to be taught there. Instead, religion is taught by parents in the homes or by the church. The majority of the Mennonites in Lancaster County, as well as throughout the country, tend to be more "progressive" than the Old Order Amish in respect to education. Among the "modern" Mennonites it is more widely believed that higher education as well as public education is an important and healthy preparation for life. In fact, there are more than eleven colleges and three seminaries directly or indirectly sponsored by Mennonite groups in North America. Although higher education above the eighth grade is still attended by less than half of the Mennonite population, most of the community supports it both financially and philosophically. Since the Mennonites are generally more open to leaving the farm than the Amish, higher education is seen by the Mennonites to be an important way to prepare one to earn a livelihood. Furthermore, the Mennonites are more involved in missionary work which is not the case with the Amish. Such missionary work often requires the skills and knowledge available from higher education. It is generally believed today that the Amish education and school system has been very successful in preparing children to live productive lives within the Amish community and society. The Amish remain firm in their objection to high school and college education. While few Amish youth even show an interest in attending high school, those who do show an interest to attend college risk excommunication. In short, by restricting exposure to unorthodox idea and limiting social contact with outside students, an Amish education preserves the traditions and values of the society and discourages the young adult from leaving the Amish community.